Undertaking a landscaping project may be difficult for people who are not naturally inclined to take care of plants. In fact, there are numerous ways for you to accidentally sabotage your landscaping plans. To ensure you are caring for your outdoor plants properly you may want to choose from a selection of hardier options. Hardy plants are almost foolproof to take care of, as they require less upkeep than alternative species. By selecting from hardy plants to create your new landscape design you can improve the overall appearance of your yard without having to worry about how long your plants are going to last. There are a few general upkeep items you must tick off your list with any plant species. Selecting from hardy plant species can help you reduce the amount of time you spend in your garden each week. 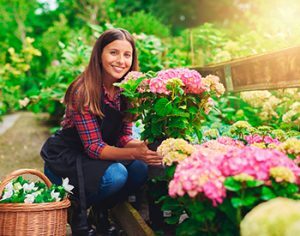 If you are unsure of whether you want flowering plants, colorful plants or something in between, then selecting from outdoor plants with the easiest level of maintenance can help make your decision more manageable. Outdoor plants are a nice update for homeowners or renters with outdoor space. Plants such as English Lavender, butterfly bush and fringe tree are easy to care for and remain hardy throughout the year. If you live in an area where you experience all four seasons, then investing money into these options can ensure you are growing durable plants, even during the coldest seasons. English lavender is considered a Mediterranean herb and can be planted in lieu of typical hedges you may select for your property. The lavender is fragrant and supplies a pleasing smell during the length of its bloom each season. This plant is known for its purple flowers and shiny leaves and can be purchased in small options if you are limited on space in your yard. Affordable, compact options include Thumbelina Leigh and Munstead. Butterfly bush must be pruned each August, but this process is not as time-consuming as it may seem. All you need to do is remove any dead leaves and prep the plant for the upcoming winter months to ensure it remains protected once the temperatures begin to drop. Butterfly bush, once pruned, begins the process of hardening itself as a form of natural protection against cold temperatures. Typically, these plants sustain themselves and do not require much human interaction to grow and thrive. One of the bonuses of selecting this hardy plant is the influx of butterflies you can expect to see in your garden when the springtime weather returns. Fringe trees experience their flowering period during the spring and summer months and develop blue to black fruit varieties once the cooler months roll around. Many species of birds are drawn to the fruit of the fringe tree, which is a bonus if you enjoy bird watching. You do not need to prune fringe trees, as they are typically hardy enough to maintain themselves through any array of weather. Fringe trees can grow to be relatively tall and wide, so you must plant them in an area where there is room to expand. Coral Bells are available in a variety of colors and can often produce a bicolor appearance depending upon the type you select. This plant is considered leaf-like in its structure and can be used to fill gaps within your existing landscape. When planting coral bells, it is essential to place them in a partly shady, partly sunny area to allow the conditions necessary to reach the most colorful hues. Coral Bells are deer resistant and do not require human care to grow and thrive throughout the seasons. Denver Daisy is a colorful alternative to traditional daisies. The Denver Daisy typically blooms in bicolor for an extended period lasting from summer until the first frost. Typically, Denver Daisies have golden petals and thick, hardy stems which make them a perfect option for those who like to cut flowers from their garden to arrange in vases throughout the house. Purple Pixie is a weeping plant, meaning the leaves grow downward from the root of the plant. The leaves adorning these hardy plants are a vibrant shade of burgundy and can easily elevate the overall appearance of your landscaped yard. In the springtime, Purple Pixies produce small, pink flowers before returning to a burgundy shade. This plant is considered drought tolerant, making it the perfect selection for those who live in warm climates. If you are looking easy to maintain flowering plants, then there are several options you can choose from before committing to a specific landscape idea. Ninebark plants produce delicate white flowers during the springtime months and are adorned with red berries throughout the remaining seasons. Ninebark blooms during all four seasons and has been used by gardeners for decades. This is the perfect choice if you want to select plants with extended flowering periods. Another option you can select for your garden is the Cotoneaster plant, which is more commonly referred to as the bearberry. This plant produces beautiful white flowers through the summer months and provides bright red berries through the remainder of the year. Cotoneaster plants grow quickly so be sure to plant it in an area where there is plenty of room to expand and grow. For upkeep, all you need to do is prune the Cotoneaster plants in your yard as needed. Agapanthus, or Lily of the Nile, is a flowering plant producing purplish-blue petals throughout its blooming period. Once planted, Agapanthus does well at expanding and growing on its own with little to no support from human interaction. If you want vibrantly colored flowers with minimal effort, investing in an Agapanthus can prove to be the solution you are looking for.